The sidewalks are the highlight. I found them to be extremely comfortable and attractive. They made me want to walk around, socialize, hang out on a bench, grab a bite to eat, and shop. I could have stayed on those sidewalks all day. They are about 16 feet wide, which feels very generous in this day and age. The pavers are attractive earth tones with a slightly glossy sealer. They are simple rectangles, arranged in a stretcher bond pattern. It is a style that is timeless and will look good for years into the future. There is just enough variation in color to provide texture and visual interest without being busy and distracting. 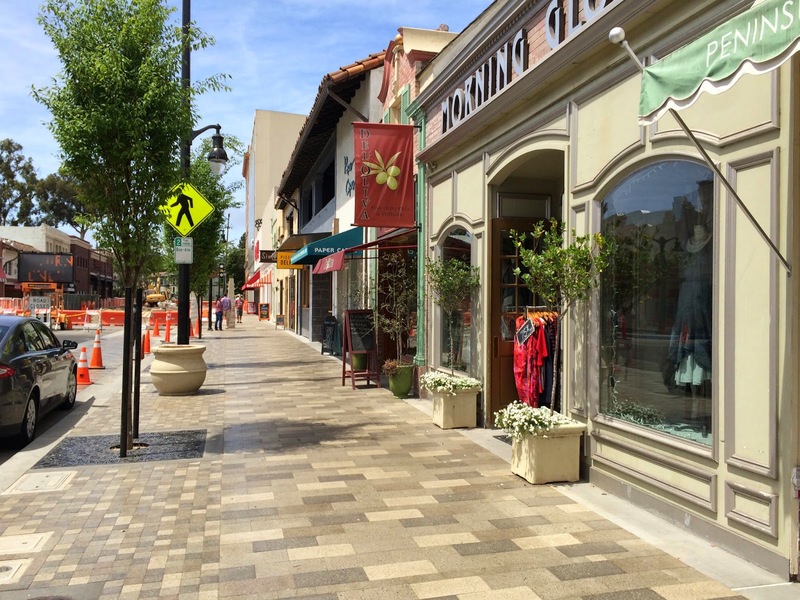 Too many streetscapes feature pavers in bright colors, complex shapes, and intricate patterns (or colored and stamped concrete) that don't contribute much value and may even look outdated within a short period of time. This design avoids those pitfalls. The sidewalk materials evoke the elegant simplicity of European streets. It is true that if the proportions of the street width and height are right and the facades of the buildings are extremely attractive, you can get away with scant sidewalk materials, but quality materials are a nice touch on particularly important streets, and I think Burlingame Avenue warrants it. The street trees are evenly spaced and form a straight line a few feet in from the curb, which is perfect. As is the case on the greatest streets, only one species is used, which appears to be Chinese elm. That is an excellent choice. If they are limbed up as they mature, eventually they will provide a nice cathedral ceiling to the street at a level which is high enough to allow excellent visibility for retail signage. It will be visually dramatic and good for business. At about 10 feet, the walkway is wide enough to accommodate leisurely strolling and more purposeful pedestrians. Conversations among pairs or groups can be had while allowing plenty of room for others to pass. The walkway hugs the buildings, as it should. While a few narrow tables with chairs occasionally sit against the buildings, the main furniture zone is out toward the curb where it belongs. Lamps, tree grates, and other furniture are a glossy black, which looks great. Black won't go out of style, and it looks clean and elegant. The upside-down double acorn lamps are nice. Tall street lights aren't necessary, but if you want to light the roadway, this type of pole is a good way to do it. It is ornamental, and includes a second lamp at the pedestrian scale. The design alternates between these tall poles and the shorter ones in the previous photo. Even the tree grates are attractive. Not only do they add visual appeal, but they show that Burlingame cares about the details, which people appreciate. Not every street needs something this nice, but it is worthwhile to spend a little extra money on the main drag. The intersections feature an elaborate circular pattern, which is attractive. However, I'm not personally a fan of such treatments. This is a part of the street where you can save some money and not hurt its overall beauty. I wouldn't have done this, but it doesn't hurt anything. On the upside, the tactile strips at the corner match the color palette and look good, and the corner radii are pretty tight, which will slow down cars that are making right turns. Also, no turn lanes were provided, which would have helped cars at go faster at the expense of parking and sidewalk space. 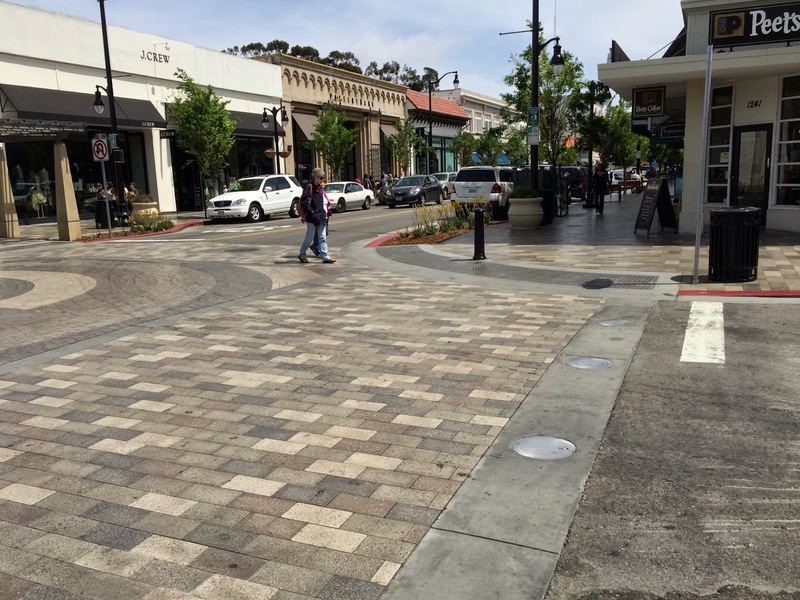 It is a mistake that is made on many downtown main streets, but which Burlingame wisely avoided. The crosswalks use the same pavers as the sidewalks. It looks good, but I prefer to keep crosswalks simple. 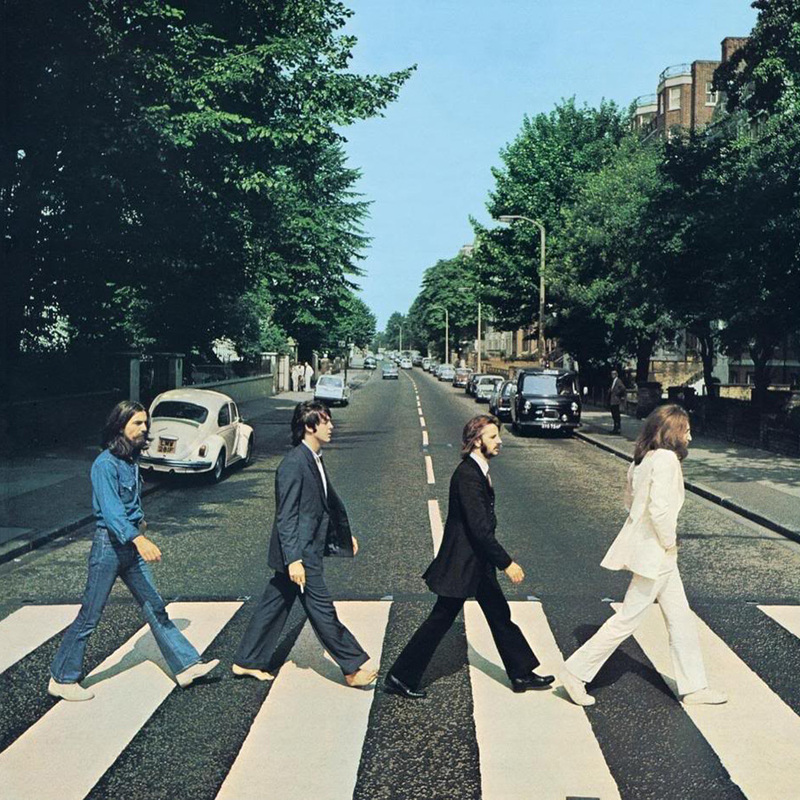 Continental striping on asphalt, made famous on the cover of the album Abbey Road by the Beatles, is very easy for motorists to see and is universally understood to denote pedestrian crossings. They are also inexpensive to build and easy to maintain. And, what could be cooler than looking like a Beatles album? The bulbouts at the corners feature a system meant to absorb as much storm water into the ground as possible without putting it into the storm drain system. If you must do something to accommodate NPDES rules, then this isn't such a bad way to go. For my taste, though, I would prefer more pavers in this area, or maybe another parking space. I didn't measure the travel lanes, but cars were traveling slow, just as you would want them to on this kind of street. Prior to the makeover, the curb parking was diagonal, but it has been converted to parallel. This change probably caused a loss of parking stalls, but the extra space was seized for pedestrians, and it was a worthwhile swap. There are't any bike lanes, but I would argue that they are't necessary here. Many cyclists are comfortable on such slow streets without their own dedicated lane. The pavers in the parking lane are nice, but I don't feel that they are necessary. Granted, the pavers and concrete band can serve to visually narrow the roadway, which slows down traffic and is worthwhile. However, when cars are parked you don't need this effect, because the cars do it better than paving ever could. I think asphalt would have been fine. One block of the old streetscape remains, at the eastern end near California Drive. It is hard to overstate how much of an improvement the new design is. Here, brick crosswalks were augmented with white stripes to improve visibility. Sidewalks are too narrow, and street trees are a low slung, irregularly spaced miss-mash of species which block business signage. The old sidewalks are concrete with exposed aggregate. It looks very dated. This stretch also reminds us that we shouldn't use any paving that we aren't going to be willing or able to patch. At the other end of the street, near El Camino Real, work is ongoing. Making such dramatic improvements requires wholesale destruction of the street, and this can be quite traumatic for the area and its businesses. It is always a challenge to provide access to the businesses and to coax visitors into areas that look like this. Such problems are temporary, though, and dealing with them is usually worthwhile in the long run. 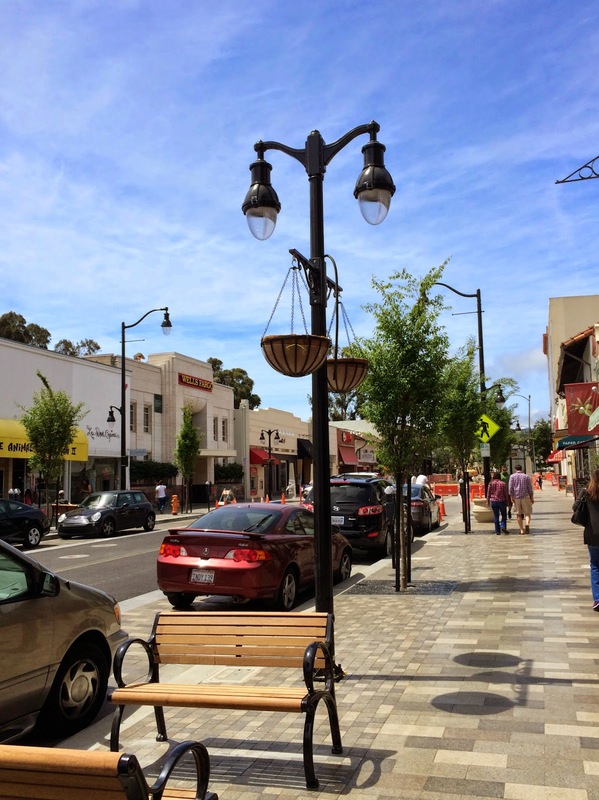 Overall, this new streetscape for Burlingame Avenue is a big improvement. A big tip of the hat to my compatriots to the north for having the guts to take this on and for going with a design that functions well right out of that gate and which will age well. Next time you're in the Bay Area, you should definitely check it out. Beauty is an economic development tool, and I have no doubt that this project will pay for itself many times over by attracting ever greater numbers of people to the area. Retail sales will increase and new businesses will sprout up, resulting in more sales tax revenue for the City and more prosperity for merchants. If this streetscape project is combined with a good land use plan then it will certainly attract high quality infill development, which could provide much need housing for the region in a walkable, transit-connected location that would be great for the environment and for the City's property tax rolls. The most important benefit, however, is the civic pride that this will undoubtably bring to the citizens of Burlingame. This is definitely something that they should be proud of, and I hope they enjoy it for years to come. Dan, I work down the street from you managing the Countywide Water Pollution Prevention Program for the City/County Association of Governments. In our role of helping the municipalities in San Mateo County meet stormwater regulatory requirements, we're increasingly seeing the need to incorporate distributed stormwater management systems throughout our urbanized areas over the coming decades in order to meet water quality goals, make our existing flood control-based drainage systems more sustainable, and provide resiliency in a changing climate. Managing runoff from transportation infrastructure is going to have to be a big part of that. Green infrastructure integrates very well with the types of pedestrian and streetscape improvements you highlighted in this post. And with the Bay Area's focus on directing transportation dollars toward active transportation and complete streets solutions in and around Priority Development Areas as a means of supporting dense, transit-oriented developments and reducing vehicle travel and associated greenhouse gas emissions, it is a prime opportunity to also mitigate the negative water quality impacts that come from stormwater running off our transportation infrastructure. While I agree that the vegetated curb extension you show in your post could probably have been built more attractively (although it will probably look much better when the plants get established), I believe we need to get to the point of managing stormwater runoff from our roadways because it's the smart thing to do, not because you "must do something to accommodate NPDES rules" as you state in your post. I'm sure you've seen it, but if not, I encourage you to review our "San Mateo County Sustainable Green Streets and Parking Lots Design Guidebook available at www.flowstobay.org/greenstreets to see great visual examples of how green infrastructure can be effectively integrated into our transportation infrastructure. I also hope you saw the great stormwater demonstration project one block over on Donnelly Avenue in Burlingame that uses a large bioretention area and vegetated curb extension to capture and infiltrate street, parking lot, and roof runoff (can see pics of it at the same weblink above). I enjoy your posts, hope we can meet in person one of these days! HI Dan, Good synopsis. One thing that you did mot mention as it is a minor element of the street scape improvements—the opportunity was seized by The Burlingame Historical Society to include 17 or so brass historical markers along the walking route. In gives visitors and residents another source to add to that sense of place.It helps capture the feeling that there was this place long ago, not just the shiny, gleaming present many have come to know. Dear Dan, I very much enjoyed your article especially about your comment about the zebra crossings a la Abbey Road! It seems to me that an exciting downtown has less sidewalk patterns, more diverse independent retail and the importance of being "a there there" that is walkable and exciting. I hope there will be a follow up on infill development and "much needed housing" in Burlingame. I wanted to thank you for this great read about water heater replacement this topic !! I definitely enjoying every little bit of it.I have you bookmarked to check out new stuff you post.